AshleyNewell.me: Happy St Patty's Day! Ok, so I didn't really make a St Patrick's Day card. I'm not even sure I have stamps for that but I did make a green card, that counts right? I'm an oddball that celebrates St Patrick's Day even though we aren't Irish. I think it's the love for corned beef. We always had corned beef and cabbage on St Patrick's Day growing up. This year, we are on a tight budget so we aren't able to do that but hopefully we can have some soon. But today, I'm gonna make green milkshakes for DH and Brady so we'll still celebrate! My card is actually for the Clean and Simple Challenge on SCS. The challenge was to be inspired by Robeez shoes. Here's the pair I took my inspiration from. I love this Unity set! It's called Cuter Than Most. 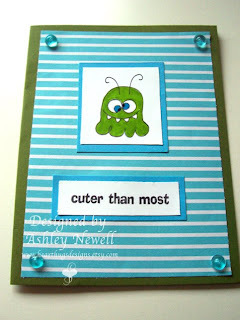 The little aliens are so cute and perfect for me since I have a little boy. I don't actually have this set, the images are RAKed to me by my friend Ky. Thanks Ky! Happy St Patrick's Day everyone! Be safe but have fun! Very cute! And those Robeez are too cute as well! Happy St Patty's Day to Ya! This is just to cute. Very creative way to use the set. The set is so much fun. He is adorable I need some monsters really bad!!! I love the Green you added and it makes a perfect St. Patricks Day card!!! Love this Ashley!! So cute! Enjoy your green milkshakes! This is wild :), just so cute. Totally counts! Especially since it's in harmony with Brady's post above! SUPER cute card! Oh My Gosh Ashley!!! That lil guy is sooo stinkin' cute!!!! I love that stripey dp too!!!! Adorable Ashley! I didn't celebrate but I had to put on my green sweatpants and my "Green Door" t-shirt... and I was home alone!